New beads seem to be coming on the market every day and many work with my existing patterns, sometimes seamlessly and sometimes with just a tweak or two. I will add these new bead adaptations and adjustments to my patterns but for those who have already purchased the pattern, I am making PDF addendums available for free here. New Addendums will be added to the top as I write them so check back often! 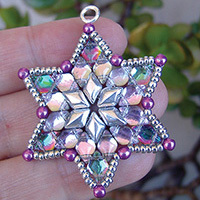 This pattern was originally designed in 2011 to use Miyuki Tila beads and bicone crystals but has since been updated because it works beautifully with 5x5mm and 6x6mm Czech two-hole tile beads instead of Tila beads and pretty much any 4mm bead will work instead of bicone crystal beads. NO new PDF required. 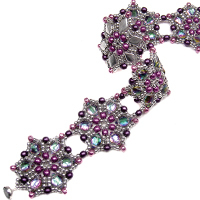 If you have already purchased the pattern, just make the bead substitutions noted above. 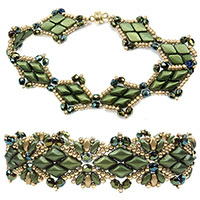 Miyuki Half Tila beads and 5x5mm Czech Tile Mini beads work like a dream as a substitute for Tila beads. 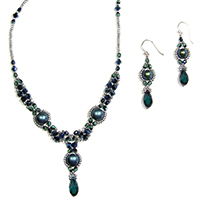 In addition, MiniDuo beads work superbly as a substitute for Twin beads. In fact, they work so well that I would recommend them instead of Twin beads. 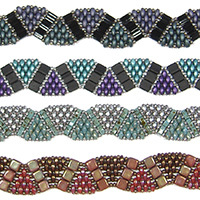 You can use full-sized Tila beads (top), Half Tila beads (middle) or Quarter Tila beads and Half Tila beads stacked together (bottom). Skinny SuperDuo band is a free pattern! 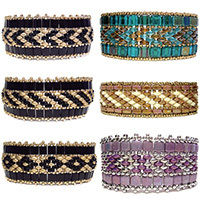 The Tila versions of these bands also work wonderfully with MiniDuo beads! NO new PDF required. 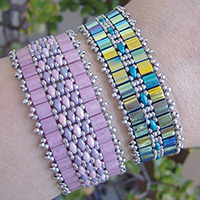 If you have already purchased the pattern, just substitute MiniDuo beads for Twin beads for the Tila versions of these bands. 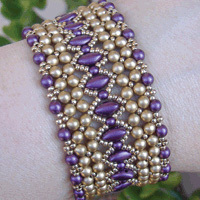 SuperDuo beads work especially well as a substitute for Twin beads in this design! This design works great with 18mm round LunaSoft cabochons instead of crystal rivolis. NO new PDF required. If you have already purchased the pattern, just substitute an 18mm round LunaSoft cabochon for the 18mm crystal rivoli. Quarter and Half Tila beads, as well as Czech 6x6mm Tile beads (the most popular brand is called “Czechmates”) and 5x5mm “Tile Mini” beads work great in this design. The Tila versions of these bands work better with MiniDuo beads! NO new PDF required. 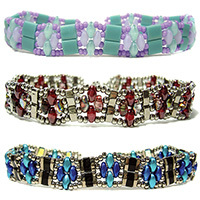 If you have already purchased the pattern, just substitute MiniDuo beads for SuperDuo beads for the Tila versions of these bands. 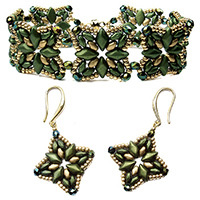 SuperDuo and MiniDuo beads work especially well as a substitute for Twin beads in this design! 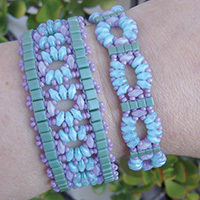 My Tila Flower Bands pattern also works great with Tile Mini beads! NO new PDF required. 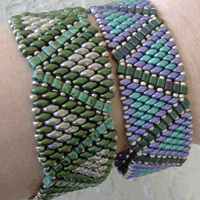 If you have already purchased the pattern, just substitute Tile Mini Beads for Tila beads for both bands. All else remains the same. 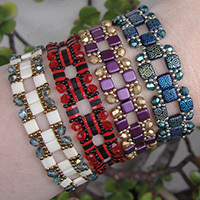 Although they are not exactly diamond-shaped, the Harlequin Band II also works great with IrisDuo beads. NO new PDF required. 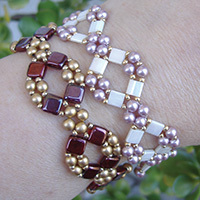 If you have already purchased the pattern, know that you can use IrisDuo beads as well as GemDuo and DiamonDuo beads. All else remains the same. 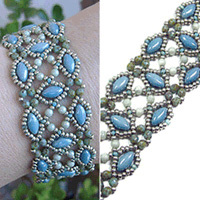 The Labyrinth Bracelet also works great with IrisDuo beads! NO new PDF required. If you have already purchased the pattern, you can use IrisDuo beads with the same substitution instructions on the last page that you use for GemDuo and DiamonDuo beads. All else remains the same. 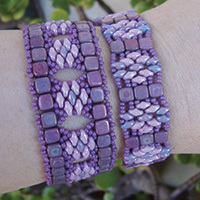 The new GemDuo beads work great with this pattern! NO new PDF required. If you have already purchased the pattern, just add GemDuo beads to the growing list of "two-hole beads" that you can use for this pattern. All else remains the same. DiamonDuo Star is a free pattern! NO new PDF required. If you have already purchased the pattern, simply substitute GemDuo beads for DiamonDuo beads. All else remains the same. However, I did add a “tweak” to Steps 31-38 outlined in a free one-page Addendum. NO new PDF required. If you have already purchased the pattern, simply substitute GemDuo beads for DiamonDuo beads. All else remains the same. 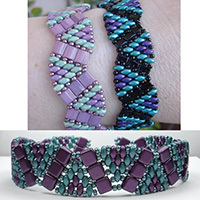 Use size 11/0 seed beads, MiniDuo beads and either Tila Beads, Half-Tila beads or the new Tile Mini beads to give the Darby Bracelet a whole new look! Since this pattern was written in 2016, new Preciosa Candy beads and 7mm Czechmates 2-hole cabochons have been manufactured! 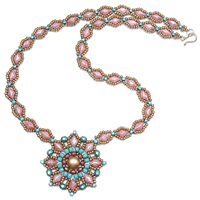 My Bubble Necklace and & Earrings pattern can be easily adapted for these new beads. Since this pattern was written in 2015, a new “Mini” 5x5mm Silky bead has been manufactured! 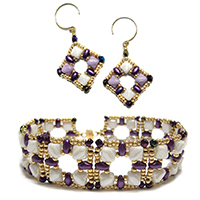 My Silky Squares Bracelet & Earrings pattern can be easily adapted for this new Silky bead size with just a few substitutions.